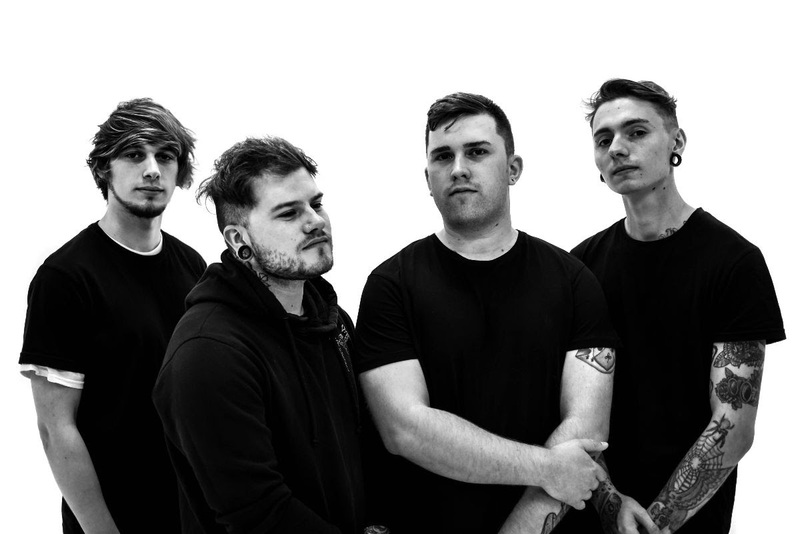 In this new occassion we have had the opportunity to interview the Metalcore band IN FEAR THEY FOLLOW from UK. Check out the interview and this band on their FACEBOOK PAGE. We just tossed around a few ideas that we had for names and ended up debating them for hours! There was a lot of back and forth regarding possible ideas and then we finally settled on “In Fear They Follow”. We all grew up listening to heavier genres of music be it Rock or Metal, but the raw emotion and pure energy in this genre’s live performances are something which we feel is unmatched and we could never satisfy ourselves with elsewhere. Playing Metal just has something extra to it which can’t be described, the aggression and energy is unique and where applicable, the technicality of the music is massively intriguing for us as musicians. The band was formed as a big mix of members from other bands that were within our local music scene. We all ‘knew of’ each other and some of us had performed together or were friends within the scene. When previous projects eventually dissolved we just naturally came together to form ‘In Fear They Follow’. Most of the lyrics are written by our vocalist Jake, who is very open within his music about his personal struggles battling mental health issues and uses music as his outlet to cope with this. He also takes inspiration from past personal events in his life and uses music as a way to tell his story. For the rest of the band we mainly get inspired by amazing riffs or grooves in songs we love, the most inspiring thing being discovering new music from underground bands experimenting in their songwriting. It’s always inspiring to hear people break the mould and write a crazy riff or section that is like nothing you’ve ever heard before. Our last gig was in Bristol at the exchange supporting The Last Ten Seconds Of Life and Lotus Eater alongside our friends in Ursus and Fangs. We’d love to play Download Festival one day, the atmosphere there is always amazing. It’s difficult to say, but we do really like Holding Absence. A feature with those guys would definitely create something really unique and interesting! For now, we’d probably say that we wouldn’t feature another ‘scream’ vocalist as we don’t feel that it would really add anything musically to what we’re doing. Perhaps in the future though! We've all suffered from some kind of stage fright or nerves at some point. Nerves still takeover when playing in front of a large crowd or alongside some big names that we look up to in music, but it’s natural. The best advice we would give to beat it is know your material inside and out - make sure you’ve practiced! But most importantly we find comfort in our band members, knowing that we can trust each other to pull off our best possible performance at a show. If you trust those around you, then you feel at ease to do what you do best. A pint or two never hurt either! The bands that have inspired us the most recently are Architects, Loathe, Shields and Wage War. All have been absolutely killing it and pushing boundaries of the genre - it’s inspired us a lot to get writing and giving it our all when playing live shows. Sadly, we are yet to have anything we would describe as a ‘weird’ request but who knows what's to come! Our fans are amazing and are always spreading the word about us, getting our music into new people’s ears. Without them telling their friends and bringing people to our shows we wouldn’t have anywhere near the amount of love we do for the music we play. We love what you’re doing to support upcoming artists and underground music, your site is a goldmine of great new bands for listeners to get excited about. Thanks for having us and be sure to check out our debut EP ‘Solace’ - Out 5th April 2019!